Last year I was humbled when I was shown just how many food insecure people have managed to grow their own vegetables. Here I am, blessed beyond belief with a roof over my head and plenty of space to grow my own vegetables. 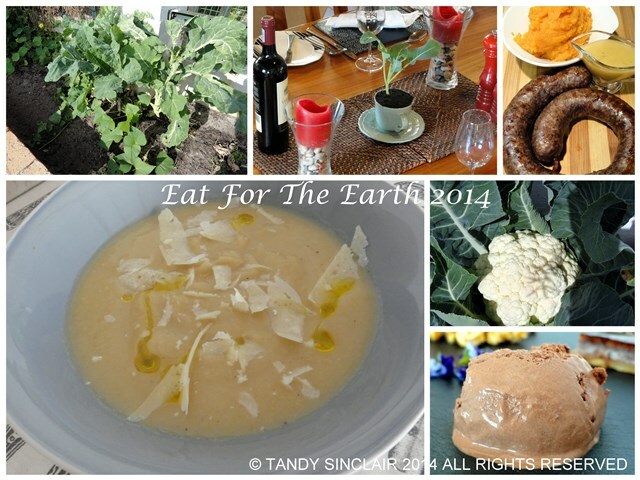 And so I made a promise that this year for World Environment Day I would be eating produce out of my own garden. At present I have plenty of sweet potatoes hopefully thriving under the soil as well as leeks, kale and cauliflower growing. We harvested an abundance of Brussels sprouts before they were attacked by some insect and as I will not use insect repellent, I had to dig the plants out and throw them away. This broke my heart as it was such a waste. I am now looking to plant celery which is a good insect deterrent and hopefully that will work. My cauliflower has been amazing. For so long you see little but upward growth happening and then all of a sudden, there is a small bump in the middle. That small bump becomes a white cauliflower head and before you know it, the cauliflower is huge, ready for picking and already being eaten by snails! Snails are another thing I cannot control in my garden, John has offered me a duck to eat them, but with 3 Jack Russell’s I fear that the snails will take over and the duck will become fair game. Each year I invite friends over to enjoy a meal, and ask for donations! Please, if you can find it within you, R10 is all I am asking for. This is less that £1 and equivalent to an espresso. On the right hand side of my post you will see the Eat For The Earth badge. If you click on it you will be taken straight to the donations page. we are so jealous of you for having the space to garden! all we have are a couple of pots with some herbs! the soups look really appetizing Tandy! Making something from your own produce always tastes better. Lovely recipe. Happy World environment day. I’m sure growing your own veggies is super satisfying! What a lovely soup this is! Creamy without the cream. Beautiful cauliflower and delicious soup! Awww…the joys and pains of gardening. But I’m sure you’ll gain more joys soon, Tandy. Thanks for the recipe! I love cauliflower but I’ve never made a soup before. I can’t wait to try! This sounds interesting. I’d love to try it! 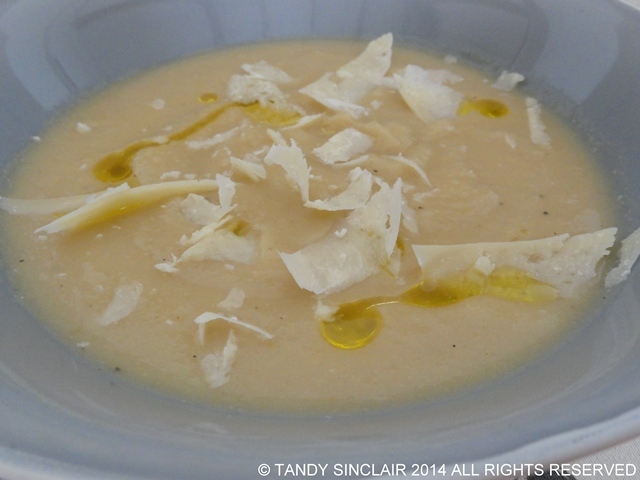 Cauliflower soup is one of my favorites! We’re close to being able to pick ours in the garden so I can’t wait to give this soup a taste! It’s so cool that you’re growing your own veggies! The soup sounds great. I love cauliflower soup. 🙂 How lovely to have your own home grown veggies, Tandy. Home grown seems to taste better I think! Hi Tandy, did not know that about celery, just planted some yesterday. I do not use any type of pesticides in my garden. After a rain I always run out to the garden with my “slug mobile: (which is a little hand held shovel) and remove the slugs. Love cauliflower soup. Well done on growing so much at home Tandy – brilliant! I am heading over to make a donation. I really appreciate that Mandy! Your cauliflower soup looks wonderful! 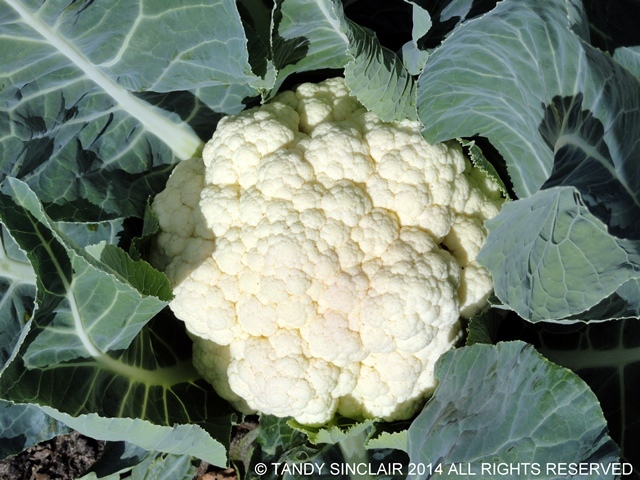 I really think cauliflower is the unsung hero of the vegetable world – something with it being white. Jealous of your sweet potatoes growing! I stay away from chemicals in the garden too, although when the bugs attacked my broccoli last year….well…I got close! Love growing my own, organic food!